Our Jersey freestone peaches are finally ready! What is a freestone peach, you ask? A freestone peach is a peach that easily breaks away from the pit in the center. They are easy to eat and more importantly, easy to bake with because the flesh pulls away from the center pit so easily. We grow 20 acres of peaches here on our farm and that is a LOT of peaches. Which, by the way, I never seem to get tired of. Living on a farm is really a blessing in life. 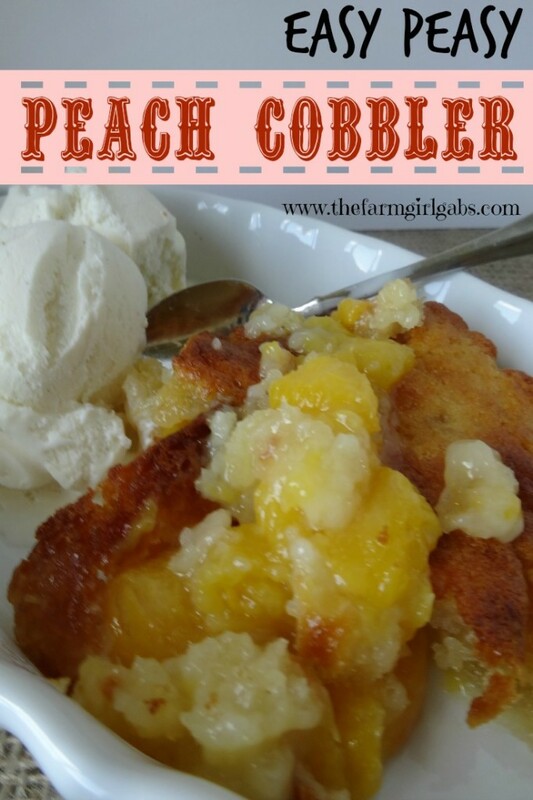 Since I’m living in peach heaven here on our farm right now, why not share with you my Easy Peasy Peach Cobbler recipe. I love cobblers. Heck, I love anything made with peaches! Peach cobbler is the perfect dessert to make during the summer peach season when peaches are in abundance or in the winter months to serve as a comfort food and a reminder that summer will soon be here. This recipe was born out of a mistake I made several years ago when I did not read the directions correctly on a peach cobbler recipe I was making. I forgot to mix the butter into the batter. So, thinking outside the box, I poured the melted butter on the bottom of the baking dish and then I added the batter over top. Guess what? It worked! 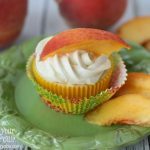 This recipe has a delicious buttery topping that rises to the top of the juicy ripe Jersey Peaches. 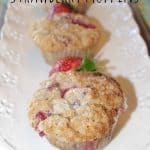 I’ve tweaked it over the years to come up with this delectable cobbler dessert. I start by peeling and slicing 6 large peaches. It’s a labor of love but it is worth it. You need five cups of sliced peaches to make this recipe. I then mix the dry ingredients together with 3/4 cup of sugar. I then add the milk and mix just until incorporated. Don’t over mix! Melt the butter and pour on the bottom of 13 x 9 dish. Pour the batter evenly on top. Do NOT mix together! In saucepan, add peaches, remaining sugar and lemon and bring to a boil. Pour the peach mixture over the batter. Do not mix together. It will look like one big mess, but I promise, it will taste delicious!!! Trust me. Pop it in the oven and bake at 375° for 40 – 45 minutes. I like to serve my peach cobbler warm with vanilla ice cream. The buttery crust, sweet peaches and cool ice cream are the perfect combination. You’ll definitely be going back for seconds. What are some of the things you like to make with peaches? I’d love to hear from you. Looking for another great peach dish? Try grilling them. Here’s the recipe for my Grilled Peaches with Vanilla Ice Cream. Peach cobbler is a perfect year round dessert. This cobbler has a butter topping that compliments the juicy Jersey peaches. You'll be going back for more. Peheat oven to 375 degrees. Pour melted butter into 13 x 9 inch baking dish. In medium mixing bowl, combine flour, 3/4 cup sugar, baking powder, salt and mix well. Stir in milk but do not over mix. Pour this batter over the butter but do not incorporate. In medium saucepan, combine peaches, 3/4 cup sugar and lemon juice. Bring to a boil over high heat stirring constantly. Pour peaches over batter but do not mix together. I’d love a dish right now, please! Looks so yummy! I love peach cobbler, yours look great and easy. Hope you see you Friday for our Anything Goes linky. I made an apricot cobbler earlier this summer and it was excellent,I can’t wait to try your peach one. This looks really good…. and just in time for the season. 🙂 Thank you for sharing this. Peaches are just my favorite! So delicious! We will just love your all time classic Peach Cobbler, yum! Thanks so much for sharing with Full Plate Thursday and have a great weekend! That looks way to good. I want some now! Thank you for linking up to the Bloggers Brags Pinterest Party. I have pinned your post to the Bloggers Brags Pinterest board. I love easy peasy and I love peaches. SCORE! Beautiful cobbler Melissa. Wanting some of this. I’ll be over in 5 with the ice-cream. I adore peach cobbler, yay for peach season! Thanks for the simplified recipe.